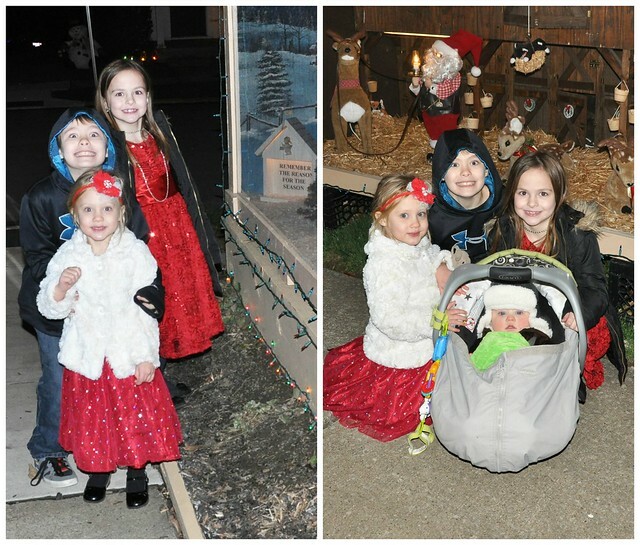 One of our favorite Christmas traditions is our annual trip to see Santa in the nearby town where I grew up! 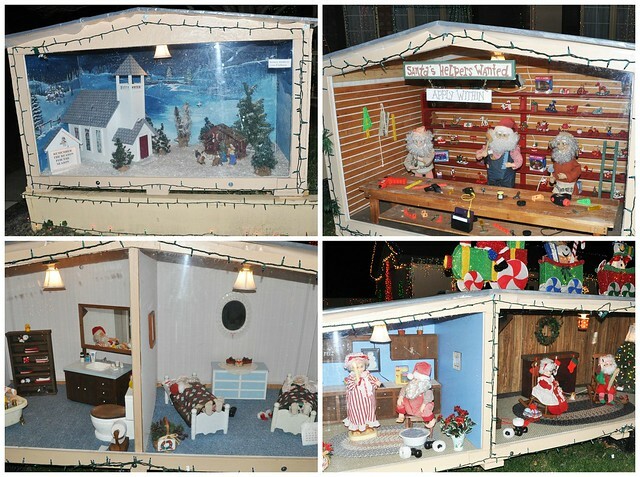 I visited Santa at his little house, in the center of town, when I was a child. 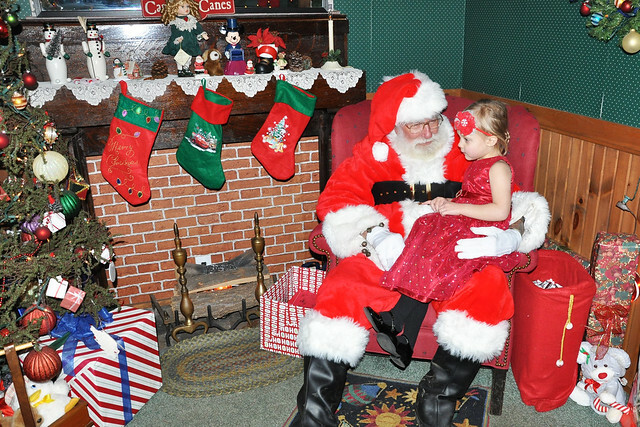 My dad eventually "filled in" for Santa there for several years. 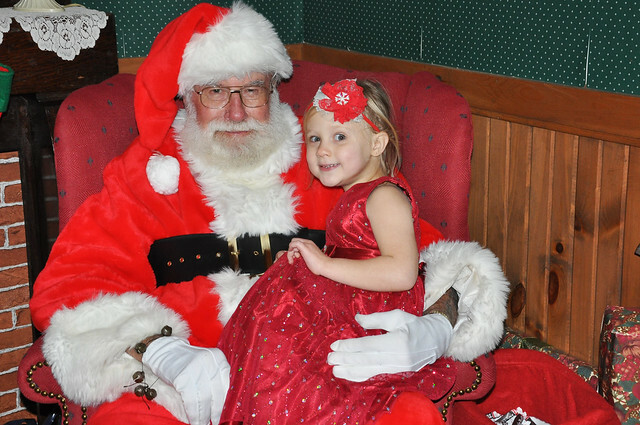 My kids know that Santa can't be at every mall/place around the world, so he has helpers that work with him. 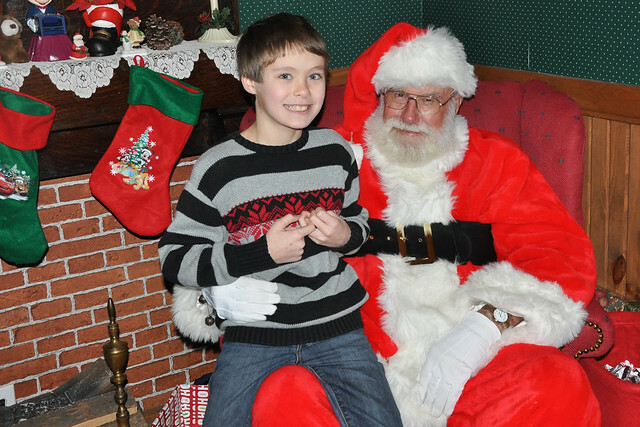 ;) When Dylan was just a few weeks old, we took him to see Santa at that little house, and we go back every year. This tradition holds a special place in my heart! We make it a big family night, and we all look forward to it! 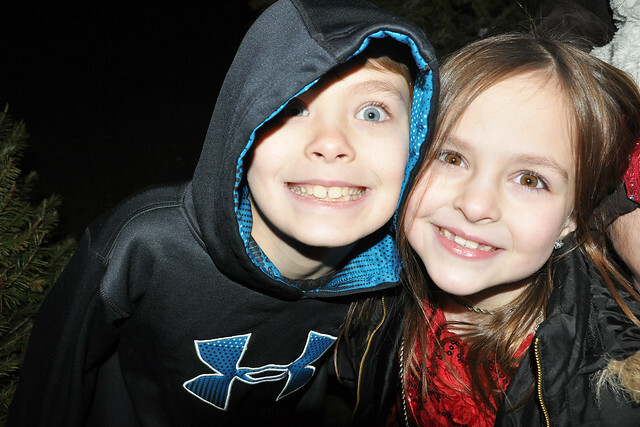 We visit Santa at his little house, then have dinner at Pizza Hut, and we finish our evening with a visit to a nearby house with light displays. This year (technically last year! 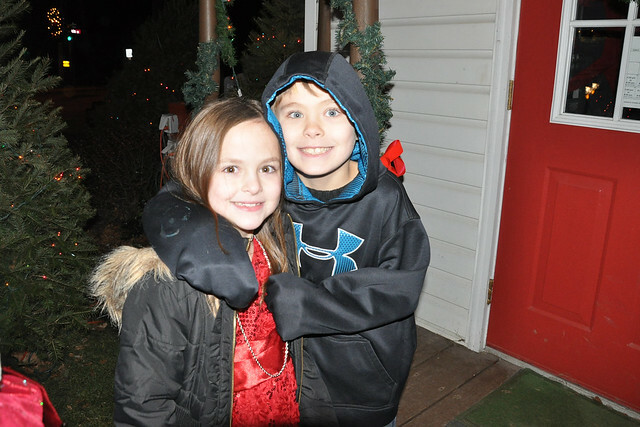 ), we went the week before Christmas. 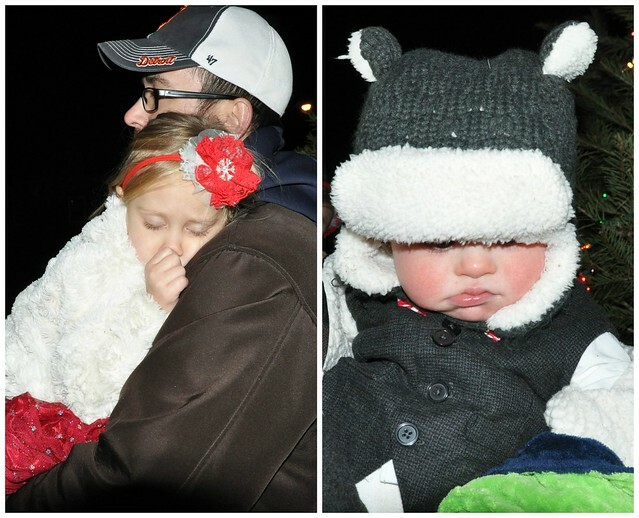 Of course, we picked the only freezing night in December! 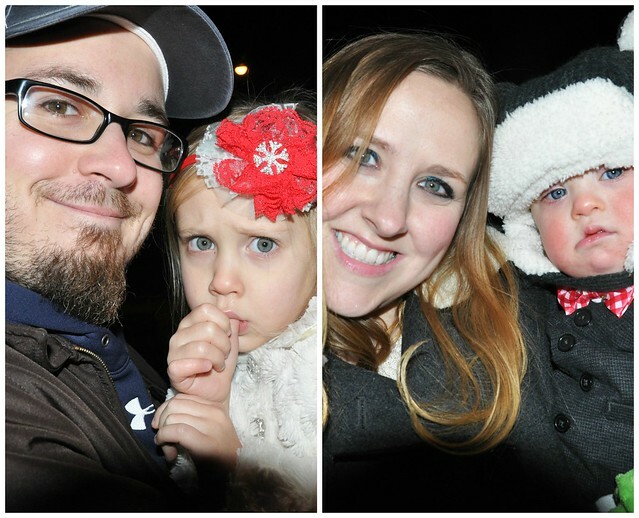 Despite waiting in line, in the cold weather, the kids were so excited to see Santa! Well, at least the older two were excited! Luckily, we didn't have to wait too long! 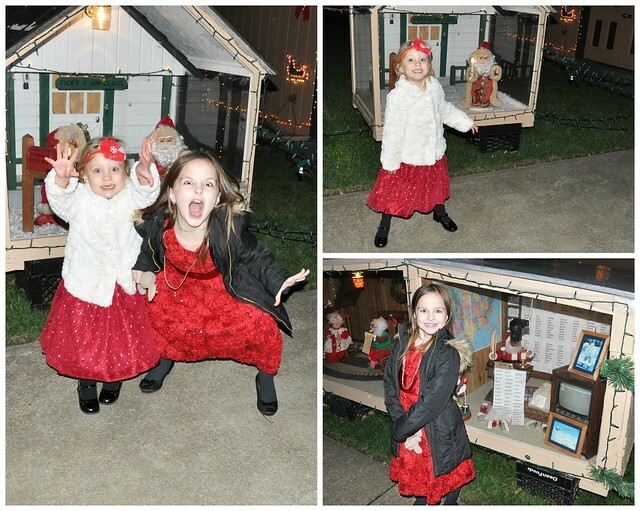 Finally, we were on Santa's front porch. 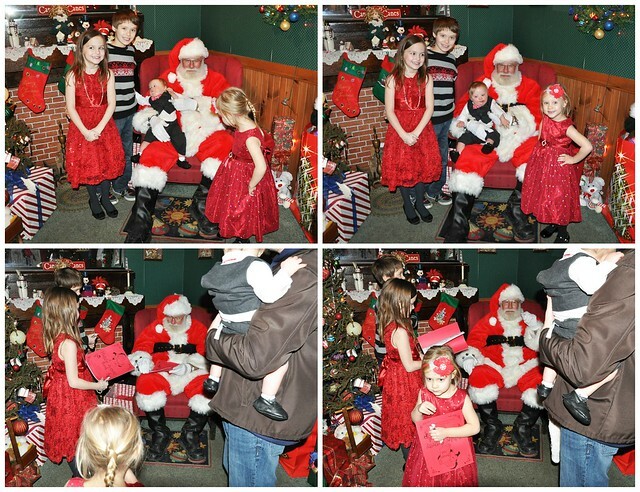 With four kids, you need a plan of action before visiting Santa. We decided on oldest to youngest, followed by an attempt at a group picture! Dylan went first. 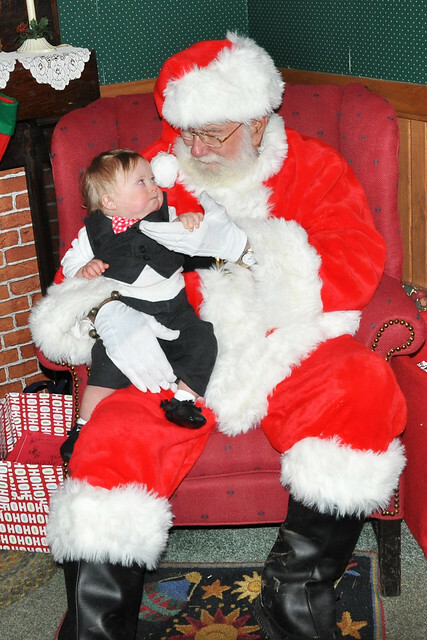 It makes me so sad that he might be too big to sit on Santa's lap next year. 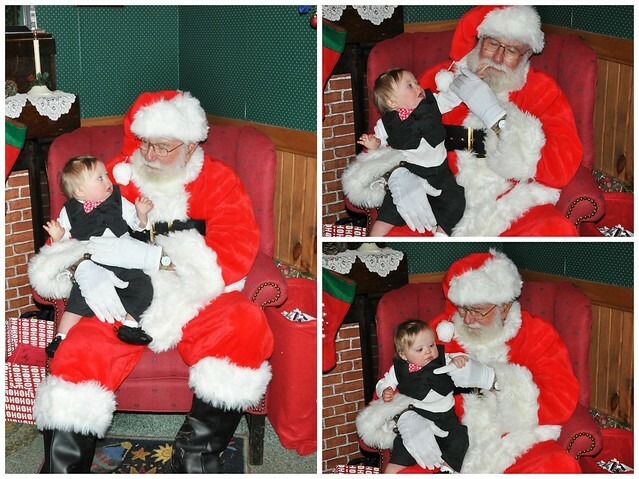 As he told Santa what he wanted, I couldn't help but notice how BIG he looked sitting on his lap, and my mind kept flashing back to the tiny baby sleeping in Santa's arms. How quickly time flies! Lily made us all laugh! 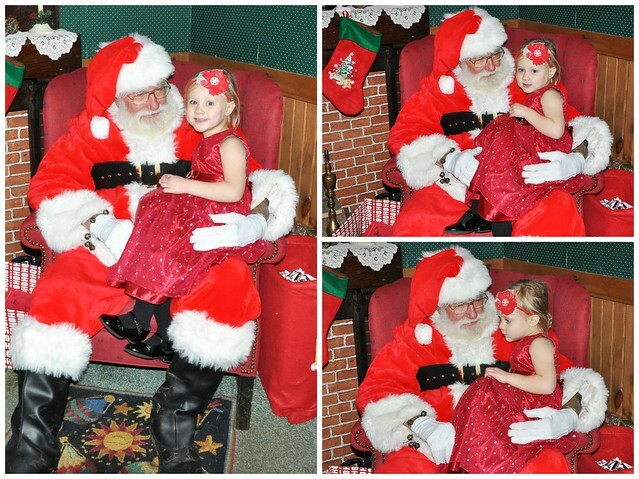 When she first climbed on Santa's lap, they had to discuss just how pretty her dress was! 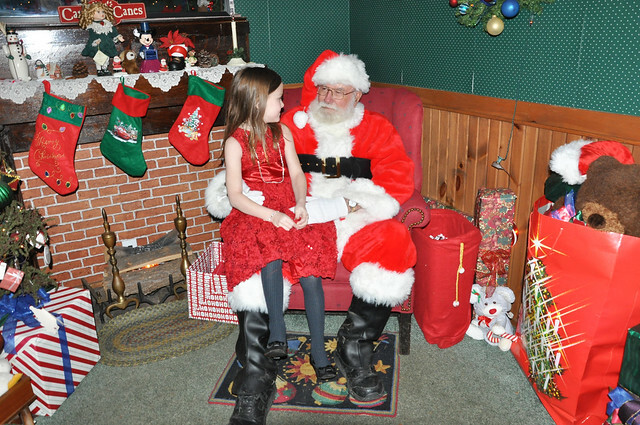 After that, Santa asked her what she wanted, and she promptly replied, "I want a panda that burps and poops!" 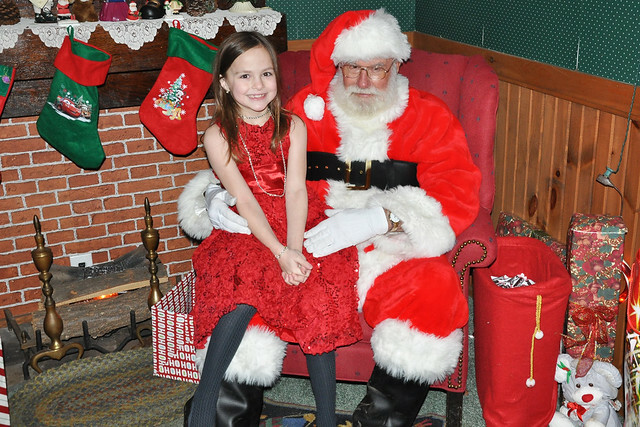 The photographer who was sitting in the corner immediately started laughing, and I could tell Santa had a difficult time keeping a straight face! She is such a character! Liam was last. He didn't smile until the end (and I missed it! 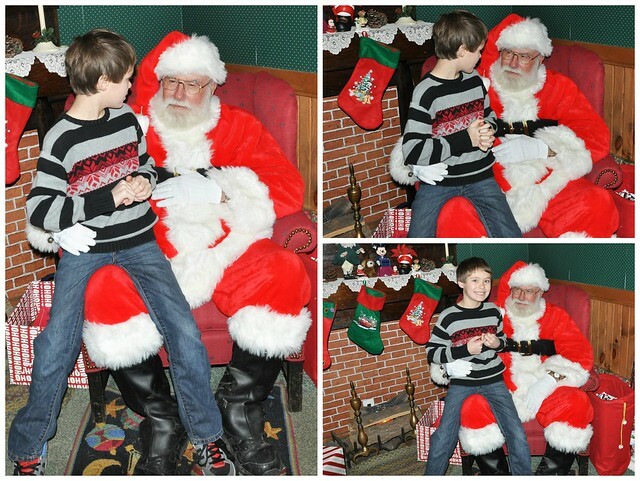 ), because he was too busy checking to see if Santa's beard was real, and holding onto his hand. It was so sweet! Like I said, we attempted a group picture. It didn't work very well! 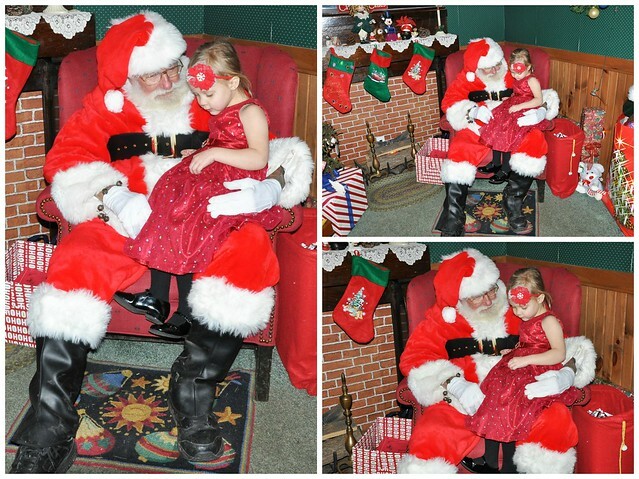 Santa handed out coloring books and candy, wished us a Merry Christmas, and we said our goodbyes until next time! By that point, we were starving, so we decided to go out to eat before visiting the light displays. 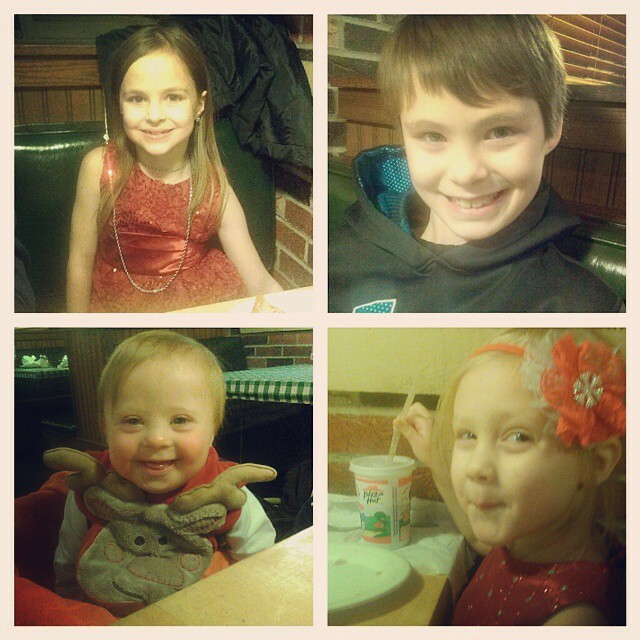 We love our yearly trip to Pizza Hut (the only pizza I like, but we never go any other time of the year! ), but this year the service was awful. Thank goodness the pizza was still delicious! We finished our evening at the house with all the light displays. We love to see our old favorites, and discover new things that were added. We had a great evening together! 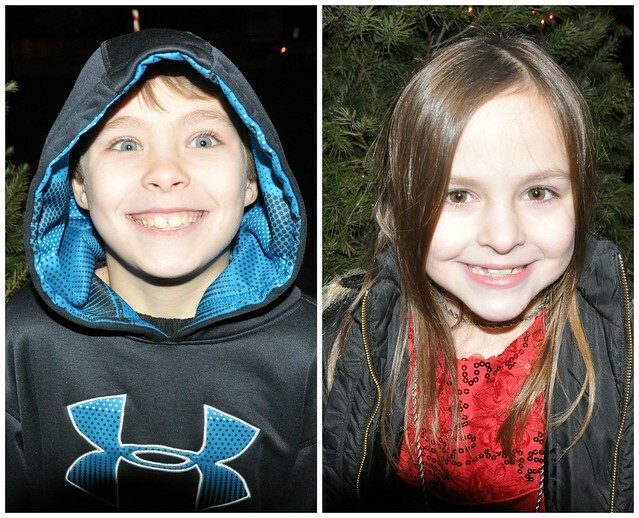 I love my crazy little crew! Thank you! I can't believe it's FEBRUARY already! Other pizza is eh, okay, but I love Pizza Hut thin crust! Love your crazy crew. 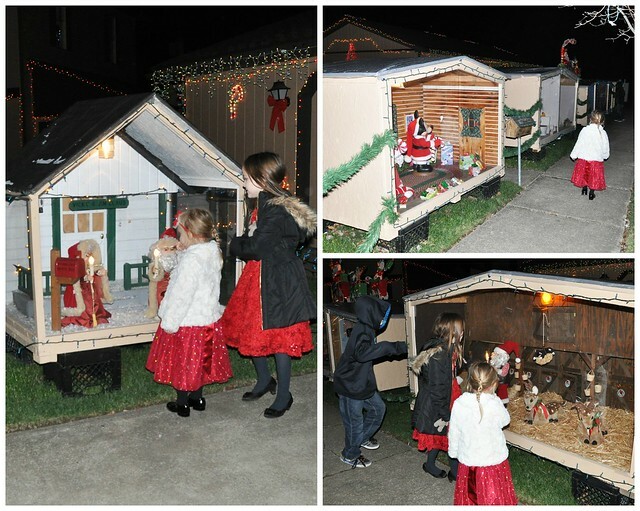 We did not visit the lights because we were freezing but the Santa house was fantastic. Love you, too! You did pick a really cold night to go!